The son-in-law of the ousted prime minister Nawaz Sharif and his wife had arrived to appear before the Islamabad accountability court. Retired Captain Muhammad Safdar was taken into custody by a team of the National Accountability Bureau (NAB) minutes after he landed at Benazir Bhutto International Airport along with his wife Maryam Nawaz from London in the early hours of Monday morning. The son-in-law of the ousted prime minister Nawaz Sharif and his wife had arrived to appear before the Islamabad accountability court in connection with a reference filed by NAB as required by the Supreme Court’s verdict in the Panama Papers case, TV channels reported. The NAB authorities had to seek help of the Islamabad police when the charged workers of the ruling Pakistan Muslim League-N lay down in front of the NAB vehicle carrying Capt Safdar. 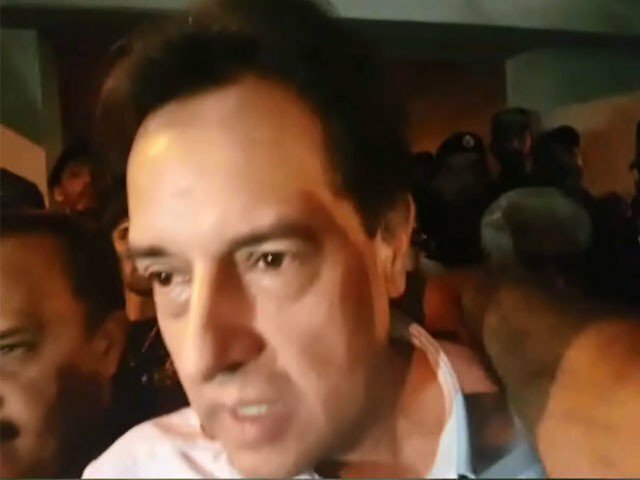 The arrest follows issuance of non-bailable warrants by the accountability court for Capt Safdar after he failed to appear on previous hearings despite notices. Amid slogans by the PML-N supporters, Maryam Nawaz left the airport for the residence of PML-N leader Chaudhry Muneer, reports said. Earlier, before her departure for Islam­abad from London on Sunday, Maryam Nawaz said that the so-called accountability of her family continuing for the past over one year was not for justice but for revenge. But she quickly added that she was returning “to test the judicial system”. Both Capt Safdar and Maryam Nawaz are scheduled to appear before the court on Monday in connection with the NAB reference pertaining to London properties owned by the Sharif family. The trial judge had earlier issued non-bailable warrants for the arrest of Captain Safdar and Hassan Nawaz and Hussain Nawaz for failing to appear in court in the last hearing held on Oct 2. The court, however, repeated the bailable warrants for Mr Sharif’s daughter. “However, we are going back and will appear before the court and go through the wheels of justice. We respect the rule of law and the Constitution,” she told Geo News. She appeared agitated when asked that the re-election of her father as the president of his own faction of the Pakistan Muslim League had created confrontation between institutions. She said that the next general elections would be held on time in 2018 and the government would complete its tenure. Capt Safdar told Geo News that the couple had decided to return to Pakistan on the advice of their lawyers. The court is likely to provide a copy of the NAB reference along with relevant details to Maryam and her husband if they appeared before the accountability court on Monday. The court may fix a date for indictment of Nawaz Sharif, who is all set to skip the Monday hearing.